Properly cooking food is one of the easiest ways to minimize pathogens and thus minimize the risk of foodborne illness. No matter the cooking technique there’s one sure fire way to monitor food’s internal temperature. That’s with a probe thermometer. To properly use a probe thermometer, one must insert the probe into the thickest part of the food item and hold it for a solid 15 seconds. It’s also advised to always take two readings. A couple of great sources for reliable thermometers include Cooper-Atkins and Taylor Precision. Both manufacturers offer a wide variety of digital and analog thermometers. Cooper-Atkins’ HACCP Manager is a great tool for taking food temperatures, collecting data and monitoring an operation’s performance over a long period of time. You can read more about the Cooper-Atkins HAACP Manager by clicking here. For those operations that utilize analog pocket thermometers, Cooper-Atkins also offers The Val-Cup, a simple, sure-fire tool to calibrate thermometers to ensure their accuracy. 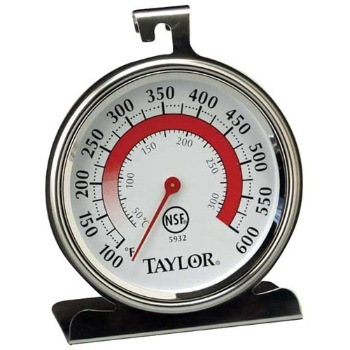 Taylor offers a wide range of pocket thermometers. They even have color-coded thermometers so operators can use them for the appropriate food products. Thermometers are extremely important tools in the foodservice operation. Using them diligently will ensure that food is done to it’s proper minimum internal temperature while minimizing the risk of foodborne illness. 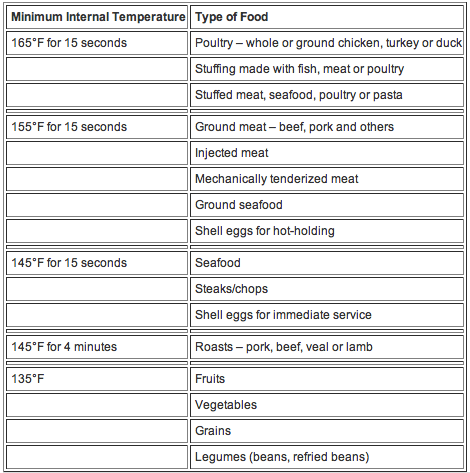 Below is a table illustrating the minimum internal temperatures for common food items.